Serving up a creative mix, flavored with FAITH. 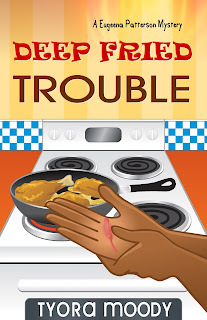 Deep Fried Trouble, the first book in the Eugeena Patterson Mystery series will be released June 2013. Tyora has coined her books as Soul-Searching Suspense. 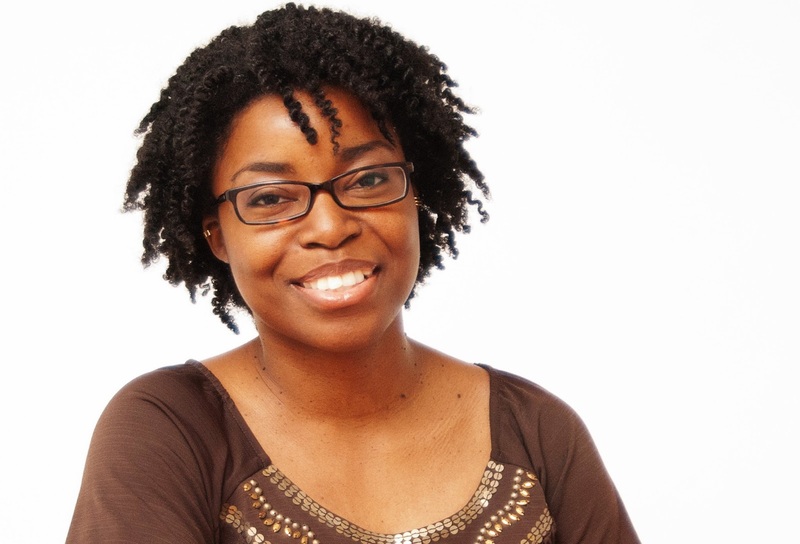 She is a member of Sisters in Crime and American Christian Fiction Writers. She served as a judge for the Christy Awards for three years. Visit the author online below. Can You Have a Crush on Someone After Age Fifty? I should’ve turned around and gone back into the house as soon as I saw him. That would’ve been really silly since he’d already spotted me. Eugeena Patterson, what’s wrong with you? Get it together, woman. I took a peek at my neighbor again. A quiver started in my stomach as I walked down the stone pathway in front of my home. The change of life had already paid a visit so I certainly couldn’t blame my hormones for making my knees turn to jelly. More than likely my anxiousness had to do with being a widow almost three years. The loneliness of my home, once occupied by a family of five, had grown claustrophobic. Being officially retired, only a few days ago, after thirty years of service as a social studies teacher didn’t help matters. All this free time on my hands made me act peculiar. I couldn’t believe that at my age, with three grown children and now three grandbabies, I had become infatuated with some man. An old one. But not bad looking, as far as I can tell with my new bifocals. If only he wouldn’t be looking at me. Over the shrubbery that separated our property, Amos Jones waved at me. What could I do but be neighborly? I plastered a smile on my face and waved back. Lord, please don’t let me say anything crazy. So often I ended up feeling like I’d just put one of my size nine feet in my mouth. With as much tact as I could, I smoothed my Patterson Family Reunion shirt around my hips, which didn’t outline my rolls anymore. Praise the Lord! One good thing about walking, I’d lost thirty pounds. My steps even felt lighter. I never had an hourglass figure mind you, but at least my pants weren’t riding up between my thighs. That would have been too embarrassing. Sure enough as I reached the sidewalk, Amos drove his lawn mower alongside me. The way he grinned, one would’ve thought his mode of transportation resembled a shiny red sports car. Men and their toys, especially the ones with wheels. My impression of him remained the same as the first time I saw him over a year ago. He reminded me of Harry Belafonte. One of those men who managed to look more distinguished with age. Now me? At fifty-nine, I looked nothing at all like the younger version of myself. Not that I was ever a beauty queen. “How ya doing this morning, Mr. Amos?” My cheeks burned from grinning. “You got your grass looking all good, as usual.” My right eyelid started to twitch. I hoped he didn’t think I was batting my eyelashes. Book Giveaway! 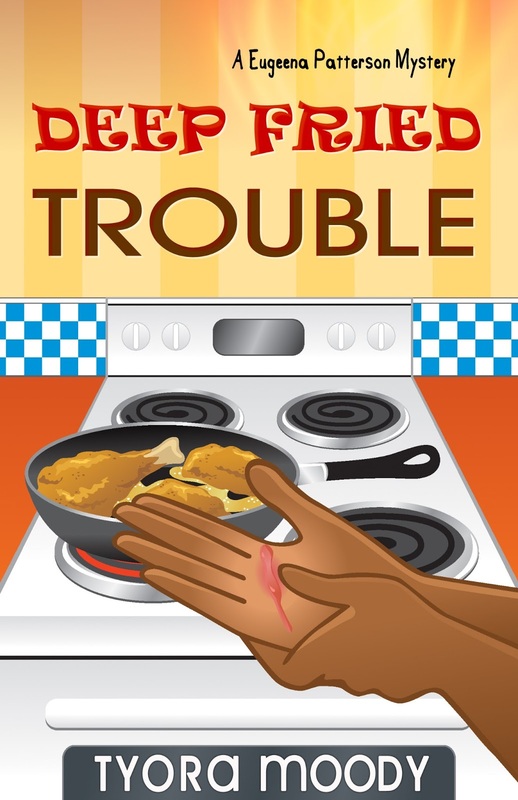 Are you ready to get into Deep Fried Trouble? Okay, you read a little about Ms. Eugeena’s crush on Mr. Amos Jones. What do you think? Can You Have a Crush on Someone After Age Fifty? Enter your response in the comment section. 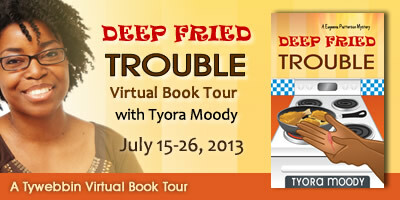 You just might win an autograph copy of Deep Fried Trouble!